An international UC Riverside-led team has a new sample that provides the best measurement yet of when and how fast galaxy clusters stop forming stars in the early Universe. The international UC Riverside-led SpARCS collaboration has discovered four of the most distant clusters of galaxies ever found, as they appeared when the Universe was only 4 billion years old. Clusters are rare regions of the Universe consisting of hundreds of galaxies containing trillions of stars, as well as hot gas and mysterious dark matter. Spectroscopic observations from the ground using the W. M. Keck Observatory in Hawaii and the Very Large Telescope in Chile confirmed the four candidates to be massive clusters. This sample is now providing the best measurement yet of when and how fast galaxy clusters stop forming stars in the early Universe. As anticipated, the team did indeed find that many more galaxies in the clusters had stopped forming stars compared to galaxies of the same mass in the field. Gillian Wilson, professor of physics and astronomy at UC Riverside, added, “Fascinatingly, however, the study found that the percentage of galaxies which had stopped forming stars in those young, distant clusters, was much lower than the percentage found in much older, nearby clusters. While it had been fully expected that the percentage of cluster galaxies which had stopped forming stars would increase as the Universe aged, this latest work quantifies the effect.” The paper concludes that about 30% of the galaxies which would normally be forming stars have been quenched in the distant clusters, compared to the much higher value of about 50% found in nearby clusters. Several possible physical processes could be responsible for causing environmental quenching. For example, the hot, harsh cluster environment might prevent the galaxy from continuing to accrete cold gas and form new stars; a process astronomers have named “starvation”. Alternatively, the quenching could be caused by interactions with other galaxies in the cluster. These galaxies might “harass” (undergo frequent, high speed, gravitationally-disturbing encounters), tidally strip (pull material from a smaller galaxy to a larger one) or merge (two or more galaxies joining together) with the first galaxy to stop its star formation. The research paper can be found in the journal Astronomy and Astrophysics. 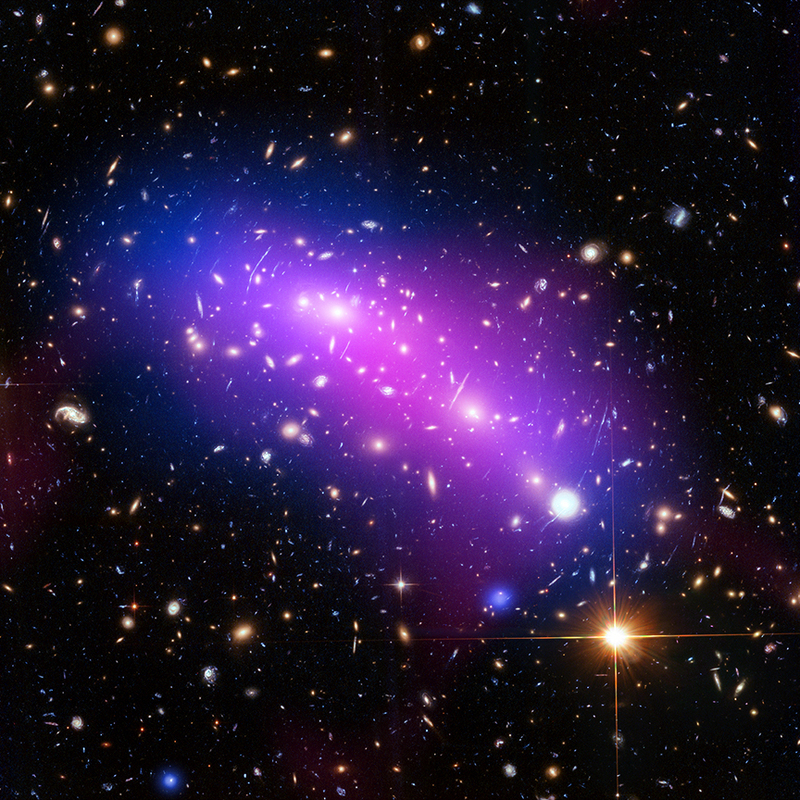 Top image: Massive galaxy cluster MACS J0416 seen in X-rays (blue), visible light (red, green, and blue), and radio light (pink). Credit: NASA/CXC/SAO/G.Ogrean/STScI/NRAO/AUI/NSF. Lower image: Color images of the central regions of z > 1.35 SpARCS clusters. Cluster members are marked with white squares. Credit: SpARCS Collaboration. Text by Mario De Leo-Winkler based on material by G. Wilson and J. Nantais.